It's twice as easy to find City of Industry tee times thanks to a pair of classic gems that make up Industry Hills Golf Club: The Dwight D. Eisenhower Course and the Babe Didrikson Zaharias Course. The Eisenhower course, named after the nation's 34th President, is a long-hitter's dream come true. Affectionately nicknamed The Ike, this Billy Bell and Casey O'Callaghan design stretches 7,211 yards. A par 73, Ike plays to a 74.8 rating and a 140 slope with Bermuda grass. The Ike underwent a number of renovations and reopened in 2006 with upgraded bunkers and challenging greens to compliment its long, beautifully manicured fairways. Industry Hills Golf Club - Eisenhower Course tee times are available from 7 a.m. to 6 p.m. on weekdays, 7 a.m. to 1 p.m. on weekends and holidays. 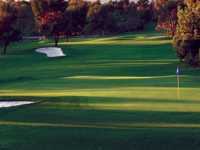 City of Industry golf deals are plentiful at The Ike, including a Stay & Play package at the Pacific Palms resort. The pro shop stocks all the best brand name equipment while the staff is available for lessons, swing analysis and custom orders. Industry Hills also includes a double deck driving range with lights for practicing after sundown. Golfers can make a quick pit stop at the Snack Shack. Industry Hills also offers plentiful options for parties, dinners or special golf events.